After Ray Bradbury died in 2012, many radio programs replayed interviews with the master. A fast talker, he spoke easily about his early failures, but also accredited his success to lots of practice. When the interviewer (sorry, I can’t remember which show or host) complimented his writing, he flippantly responded “well, I wrote everyday for twenty years and got good at it!” If genius played a part we’ll never know, as the author himself explained that he had learned the craft through dogged determination. I just finished reading the biography titled Theodor Seuss Geisel by Donald E. Pease and Stephen King’s On Writing. It was no surprise to learn that Geisel (Dr. Seuss) had cut his teeth at the Dartmouth humor magazine titled Jack-O-Lantern and was a successful cartoonist long before he ever wrote his first children’s book And To Think That I Saw It On Mulberry Street in 1937. The book, while acclaimed by some, was dissed by several publishers who thought that the lack of a moral bucked the convention of children’s books at the time. 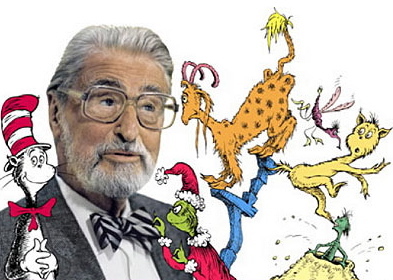 Fortunately, Seuss found his voice (and market!) to author more than forty books of which so many became best-selling classics. Similarly, Stephen King shares in On Writing that he collected his publishing rejection letters on a nail. He never stopped writing, though, and credits stylistic breakthroughs to advice he had gathered through the years. The storyteller not only stresses how much a writer should write, but how much a writer should read. The advice is so obvious, it stings. There’s a lot of work involved in great writing, and if writing does not take enough time, then reading takes more. It is as if King wants to shout, IT AIN’T EASY FOLKS! For those amateurs who think they might repeat the success of one-time book author Harper Lee, who wrote the monumental To Kill a Mockingbird–good luck! Practice, whether creating or consuming, is simply essential for a writer. Write more, read more, and most of all, love what you are doing.